Home » How Online HR software Can Help Manufacturing Industry? 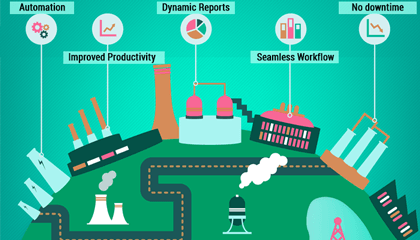 » Blog » How Online HR software Can Help Manufacturing Industry? In the USA, manufacturing sector accounts for 12 percent of GDP. It supports an estimated 17.6 million jobs in the country. For every $1.00 spent in manufacturing, another $1.37 is added to the economy, according to National Association of Manufacturers. In short, manufacturing matters. As advanced economies recover from the Great Recession, manufacturers will accelerate hiring both in production and nonproduction roles (such as design and after-sales service). It is pertinent to mention here that the manufacturing industry has changed dramatically over the last decade. It has become more dynamic and high-tech than ever before. That’s why it needs advance online HR software to manage its diverse workforce and workflow. How Online HR Software can be a savior? The high-tech manufacturing industry needs workers with advanced STEM (Science, Technology, Engineering and Math) skills. According to a recent report, The skills gap in U.S. manufacturing 2015 and beyond, over the next decade – nearly 3.5 million manufacturing jobs need to be filled and the skills gap is expected to result in 2 million jobs going unfilled. The report observes that the key reason behind this STEM skills gap is a gradual decline of technical education programs in public high schools. In this critical situation, manufacturers can innovatively use online HR software. Using HR analytics, they can not only find skilled workers but also identify a specific group of people in the existing workforce, who can be groomed and developed as the next generation workforce. By developing the higher-potential workforce and offering flexibility at the workplace, they can bridge the STEM skills gap effectively. Additionally, they can also endorse employee referral program and integrate it with the HR software to encourage the best to attract the talented. The best part of endorsing such approach is that one can measure in real-time whether their actions are yielding benefits or not. With the help of the following graph, the aforementioned report also suggests almost similar techniques to bridge the STEM skills gap. You must have noticed that every government periodically makes some changes in the compliance requirements and manufacturers must be aware of those changes. For example, California’s New Fair Pay Law is applicable across all industries including, manufacturing. Now, it is necessary for all companies (including manufacturers) to ensure accurate categorization and documentation of their workforce. It is now essential that HR leaders know the minute differences between part-time, contract, and seasonal workers so that it is properly documented in order to avoid penalties. In order to ensure the accuracy of your employee records, there is an increased need of automated systems to manage employees. A software that allows easy reporting, analytics, online enrollment with an anytime-anywhere secure access on multiple types of devices. In the USA, almost 11.1 percent wage and salary workers were union members in 2014 across all industries, according to the U.S. Bureau of Labor Statistics. Numbers of the workers may vary by the state and industry, but it is very important for all manufacturing companies to regularly update the records of union deductions and pay scale differences. According to senior HR leaders, it is the duty of your company to report the collection of union dues. HR leaders and accountants often run Payroll to calculate wages, deductions and fringe benefits, which can be time-consuming as well as complicated. If they get access to updated and accurate information, they will be able to work more efficiently. In order to generate accurate ‘certified payroll reports’, it is critical for companies to keep track of every small detail. An Online HR Software can take care of everything you need to stay compliant. Occupational Safety and Health Administration (OSHA) is very strict on safety measures in manufacturing units. Therefore, manufacturers should prepare a checklist to help production managers, safety line officers and others who perform routine audits. Most importantly, they can create an electronic checklist with the help of modern HR software and maintain a record for every audit. It can be used as a proof of compliance. One can download checklists from the OSHA’s website. Precisely accurate and real-time production reports are key to the top management’s decision-making process. With the help of modern online HR Software, one can create several type of reports for the top management, such as: functional reports, formal reports and statutory report. Managers can also incorporate analytic information (in the form of graphs and charts) in these reports. Manufacturing industry hires one of the most diverse workforce from semi-qualified to highly qualified engineers and researchers. A comprehensive online HR Software solution can help manage this diverse workforce and also help mitigate the future skill gap.